I have to start out today with an apology. I have been so focused these last couple years in creating fun quilling tutorials, that I’ve never sat down and written about basic techniques! That ends now! I’m happy to say that I’m finally taking the time to photograph some posts detailing some simple how-tos for the beginner quiller. 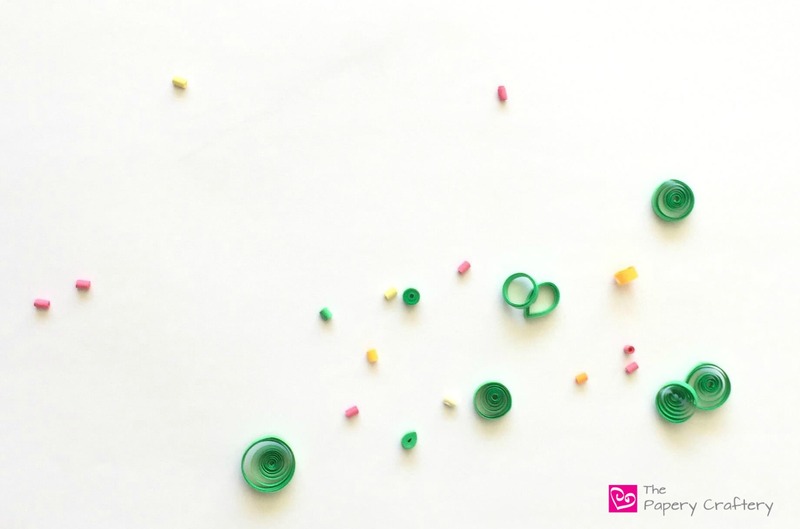 Starting off, how to make simple quilling paper coils! First thing’s first: to make quilling coils you need paper, a little glue and something to roll your paper around, called a quilling tool. There are two common types of quilling tools, a needle tool and a slotted tool. There are pros and cons to each, and each quiller has a preference. For more info, check out my post on which quilling tool is right for you. You could even use a large sewing needle, a wooden skewer or a toothpick in a pinch! Quilling paper is sold in packs of long strips and come in an amazing rainbow of colors. Some even have sparkles! When you’re ready to start quilling, tear the length of quilling paper that you need from your strip. The length of your strip will indicate how large your coil ends up. If you’re following a pattern or tutorial, you may be provided with the lengths of paper to use per coil. But once you’ve gotten some practice, you can start to remember just how much paper you’ll need to use. It’s also helpful to tear the ends off your strips before rolling. Torn edges adhere smoother with glue than cut edges. To roll a coil around a needle tool, lay the end on your index finger of one hand while holding the tool in the other. Use your thumb and index finger to roll the paper strip around the needle tool, while holding your tool still. Roll the paper all the way to the end of your strip, and you’ve got yourself a coil! When you’ve finished rolling, carefully remove the coil from the tool, holding it in a way that it won’t unroll. Lightly glue the end the rest of the coil. Coils that aren’t allowed to unroll are called tight coils. Tight coils can be made in any size, and are often the base for 3-dimensional quilling work, like these quilling paper acorns. Tight coils can be formed into other shapes, as well. Squeeze one side, and you’ve made a tiny teardrop. I used that technique when I made my daffodil petals! Most quilling work has its basis in various shapes made from loose coils. To make loose coils (also called open coils), roll the paper in the same way you roll tight coils. And just to show the difference, I’m rolling this coil with a slotted tool. Many quillers find this tool a little simpler to use, especially in the beginning days. Insert one end of your paper strip into the slot on the end of the tool. This will hold the strip in place. Next, turn the tool to roll the strip, as opposed to the needle tool, where you rolled the paper. I apologize for the funky glue dots all over my tool! Yikes! When you reach the end of the strip, pull it off the slotted tool. If you release the coil and place it on a flat surface, it will start to unravel a bit and open up. That’s your loose coil! Add a tiny spot of glue to the end and attach that to the rest of the coil. Notice the slight kink in the center of the loose coil that was made on the slotted tool. That comes from the slit in the metal end that holds the paper strip. If that bothers you, try practicing on a needle tool for a while! One more way to roll quilling paper strips is into ring coils. Ring coils are molded around larger forms, like the handle of a tool or a pen. There are also specialty molds and tools that have bigger diameters for really large circles. I’ve even used glass jars! Simply roll your strip around your form, adding a little glue to the beginning end to keep it still. You may like to add a little glue on the entire strip as you roll it around, but all that extra glue might make it a little too stiff once dry. It all depends on your needs. Be sure to glue the end before removing the ring coil from your mold. Ring coils can also be formed into shapes. Pinch one end, and you have a unique leaf! I’ve also used this shape for modern flower petals. Whew! That’s a lot of info that I just laid on you! Don’t forget to print your own quilling shapes printable to reference as you practice your coils. And this is just the beginning! There is more to learn on your quilling journey. After practicing your coils for a bit, check out the next posts in this series, all about creating teardrops and other shapes and making paper squares! These are so pretty. Never knew what they were called. Thanks JoJo! It’s a great craft: super easy and affordable with a big “wow” factor. Give it a try! I just recently saw a finished project and found out about quilling paper. It didn’t give directions, so this was a wonderful find! I can’t wait to do a project with these. I have lots of papers!! That’s so great, Aliza! Welcome to the quilling club! I’m always adding new tutorials and tips here. If you have any questions, don’t hesitate to ask! Okay I just got totally sucked into your site. I’ve never even heard of quilling and now I’m completely intrigued by the process and all the beautiful things you do with it!! That’s so great to hear! Thanks so much. I hope you’ll give it a try someday!